Wheelchairs are one of our main specialties, along with wheelchair ramps, power wheelchairs, wheelchair lifts, fitness walkers rollators, electric mobility scooters, and accessories of all types, including cushions, shower chairs, bathchairs, scooter batteries and more. Our sales team is friendly and knowledgeable, and we can ship any of our wheelchair exercise equipment or handicapped All-Terrain vehicles directly to you! We have wheelchair replacement parts as well, and for less! Our modular and portable wheelchair ramps, power wheelchairs and electric mobility scooters, huge line of wheelchair accessories and wheelchair replacement parts, hydraulic and electric wheelchair lifts, wheelchair exercise equipment, all give you instant better access, mobility and personal freedom! We guarantee all of our sales, or your money back. Let those who truly understand the needs of the handicapped cater to your personal mobility issues, with top of the line electric wheelchairs, wheelchair ramps, wheelchair lifts, wheelchair accessories, and lots of other wheelchair exercise equipment. 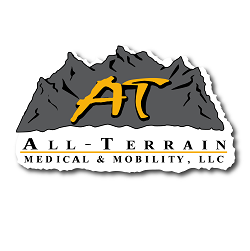 Make All-Terrain Medical your source for wheelchair sales, wheelchair ramps, wheelchair lifts, power wheelchairs, fitness walkers rollators, wheelchair accessories and wheelchair replacement parts for your convenience, including wheels, batteries, cushions and more.